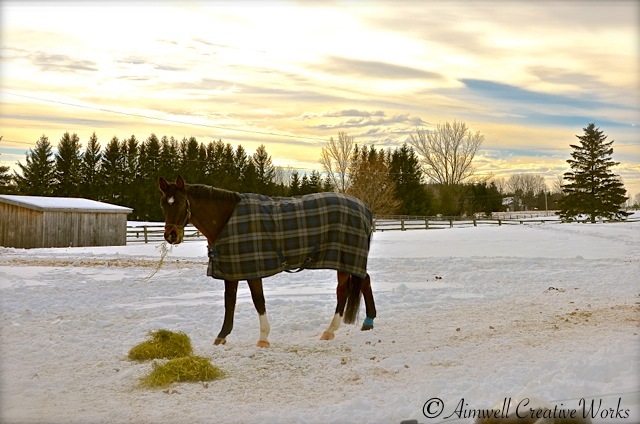 In spite of -20C temperatures Bear is settling in nicely at his new, cosy digs. Perhaps the most astonishing development is how quickly he’s managed to make new friends. Bear has a sociable nature, but never could I have imagined just how easy going he was going to be with this major transition in his life. 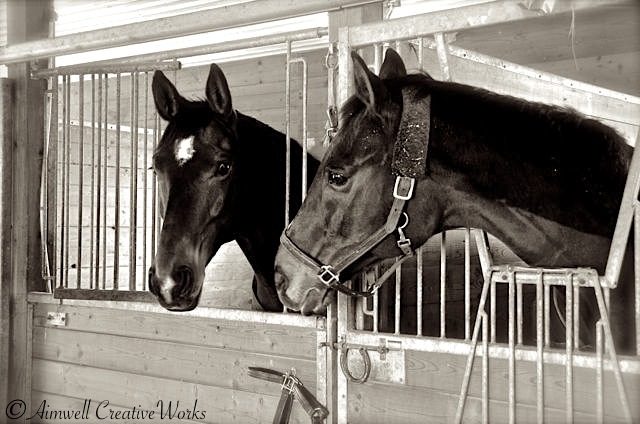 When introducing horses to each other for the first time it’s important to be mindful. Like people, horses either get along, or they don’t. 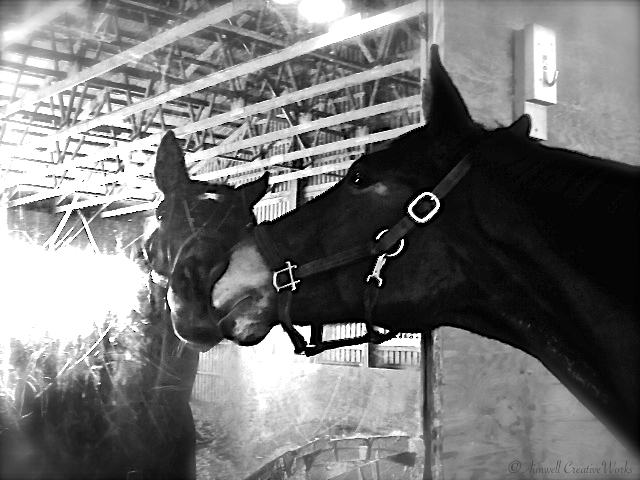 When horses don’t get along it can be pretty distressing. So, that first morning, while figuring out what would work best for all concerned, the barn manager held Bear back in the barn. Her first inclination, as is common practice, was to put him out in a small paddock by himself so he could get a sense of his surroundings. 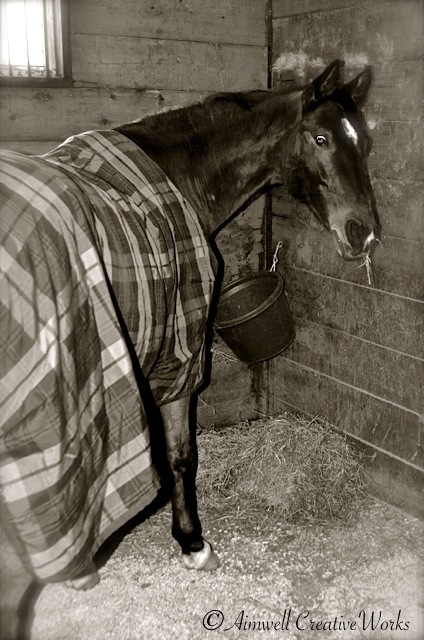 He would go out on second rotation keep a sick and unhappy horse on stall rest with a sore leg some company. But Bear wasn’t having it. He wanted to go out. So, he was turned out with two horses who just happen to be two of his closest neighbours in the barn so he would have had all that first night to start getting acquainted. Out in the paddock and after some initial squealing, which is typical of newly introduced horses, they were right as rain. I could hardly believe it when she told me. Bear’s not even in the barn 24 hours and he’s already made friends. His new paddock pals are lovely. The first is ZuZu who, you may recall, was mentioned in my previous post. 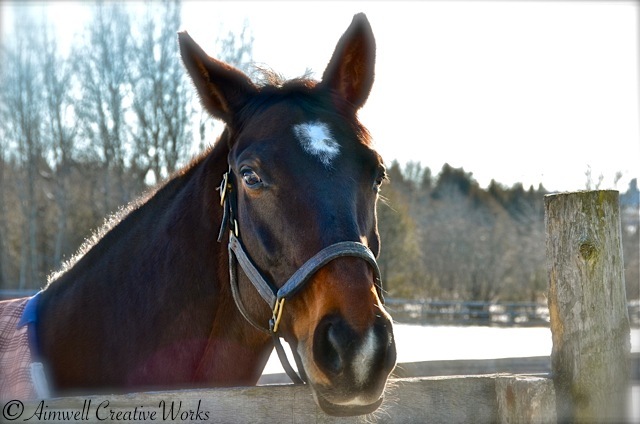 She’s a young mare of the Canadian breed. (Has Bear ever been turned out with a mare before? Certainly not while I’ve had him. Of course, there was his mother … ;-)) She’s a feisty, self-assured young lady quite able, it appears, to hold her own among the boys. Bear is mighty fond of her already, and looks for her when she isn’t nearby. I’ve also caught them making eyes at each other across the aisle. Oh, my! My boy has a girlfriend!!! He also has a new buddy. Jerome is an international show jumper in early retirement due to injury, and has been ZuZu’s paddock pal for a while already. He’s a real sweetheart and it’s clear he simply wants to be Bear’s buddy. I spied them grooming each other as I drove by their paddock and into the farm that first day. A good sign. Needless to say I am thrilled at how quickly Bear has settled in. Well, you may have noticed that my posts have been a bit sparse of late. I’ve had a lot on my mind. I’m moving Bear to another barn. As any horse owner will tell you this can be a stressful change, especially if you’ve never done it before. The years of our lives pass speedily by. It seems just yesterday we brought Bear home. He is my first horse; a dream come true. I remember the joy; the excitement; the desire to make good decisions on his behalf that would benefit us both. Flash forward almost eight years. We’ve coursed our hills and valleys together. Forged a strong, trust-based relationship. It’s been a journey wrought with trials and tribulations; joy and happiness. But he is now 12 years old and in his prime, and I am … well … I am well into middle age. I have felt, for several months now, maybe even the last couple of years, the urge to change things up. While I appreciate, and needed, all the remedial coaching I’ve received in the past few years, I feel ready to up the ante. 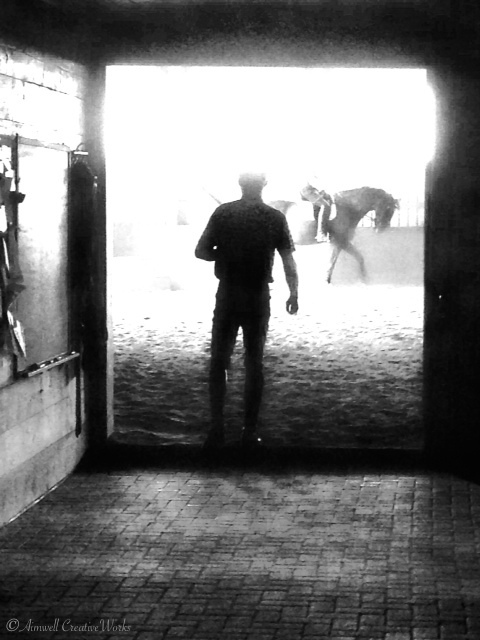 To step boldly into the dream of the dance that is dressage. Bear and I are ready. More confident; more relaxed than we were even a few months ago. Sure, there are plenty of kinks to work out yet, but it’s time for a new perspective. So, at the beginning of January, I’m moving Bear to another barn. A small, low-key, dressage-oriented barn just 10 minutes further away from home. Somewhere we can work with a new coach and a new vision of what’s possible. It’s a decision made after a month of deliberation ~ of talking with people I trust; writing down and considering the pros and cons; cogitating; meditating and, yes at some level, praying. 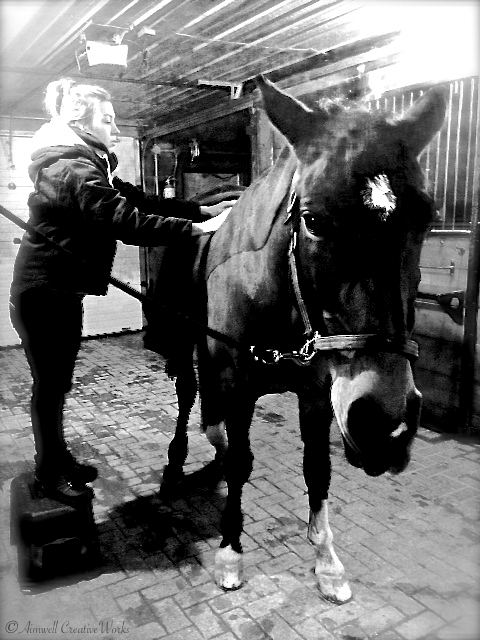 And, while the new barn presents plenty of opportunity for me to delve into the culture of dressage and develop my skills, my primary focus must be the welfare of my horse. Will he be happy? Will he make friends? Will he receive good care? Have plenty of turn-out? Eat well? Enjoy the atmosphere? Be safe? I feel that he will. I’ve known the owner for a while now. She’s been in the business a long time and judging by the warm reception I’ve received by people who already board there it appears to be a happy place. I’ve been to the barn a few times to get a feel for it. With only 12 horses boarded, it’s smaller than Bear’s current home. It’s also older and the arena is about half the size of the one we work in now, but it hardly matters. The barn is clean, and quiet, and friendly. As well, there’s access to 94 acres of hacking, including a complete cross-country course (which will be pleasant to look at ;- ) … ). There’s a proper dressage ring and a grass riding ring as well. More outdoor options. This is good. Last week the owner gifted me a ride on Connor, her beautiful retired Prix St. George mount, so I could have a lesson with my potential new coach. He is a well-respected German master and member of the bronze-medal winning Canadian dressage team at the 1995 Pan Am Games. I wanted to see if I liked his teaching style. Connor really tested my mettle and made me ride every step. The coach worked with me in every step. He has a reputation for being technical and thorough. I like that. The bottom line ~ I totally enjoyed the experience. 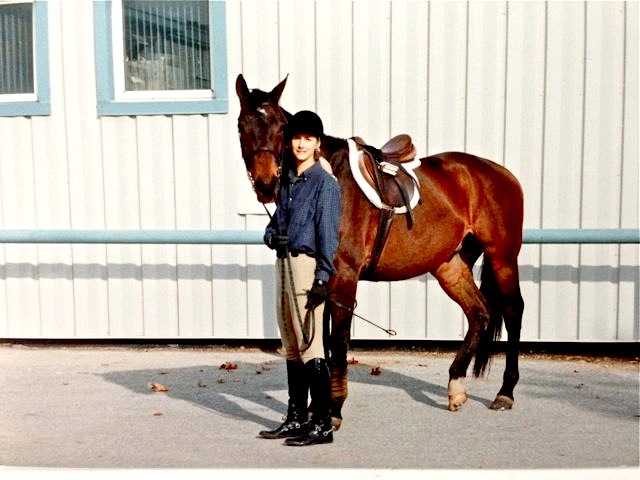 It was the first time I’d ridden another horse since owning Bear, and it left me with more respect for my ability and a desire to see Bear and I reach our potential. A move to this new barn would present us with the chance to do so. So, this past weekend I made my decision. I’m trusting my heart and taking the stall. 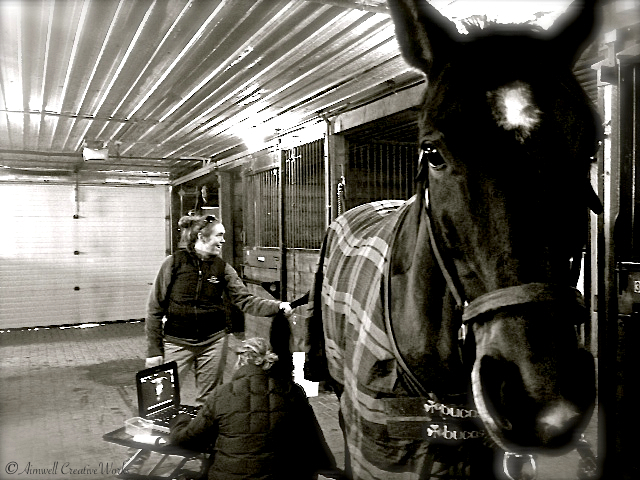 The second instalment of my Confessions of a Coaching Intern series in which I re-visit my experiences as an equestrian coach-in-training, 1995-1997. Finding clarity with a pitchfork and a song is one thing. Finding your courage on the back of a misbehaving horse is another thing altogether. In this post we’ll step back in time to the true beginning of this journey. A journey I didn’t understand until I was in the throes of the pitchfork meditation … and beyond. My story begins in 1991, four years before I chucked in corporate life. I was a naïve almost 30-something, struggling with my identity, married to a man who didn’t love me and forking over my hard-earned money to pay for his expensive Masters degree State-side. I was living in my mother’s house, childless, aimless, anxious and unhappy. My sanity? 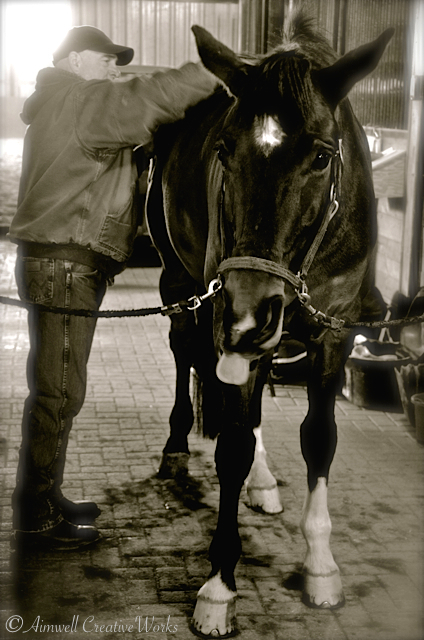 A weekly riding lesson … and singing in the Toronto Mendelssohn Choir (but that’s a story for another blog). I was riding at the farm described in my last Confessions post (featured on Freshly Pressed), only at that time it was under different management and my intentions were much simpler. I just wanted to ride nice horses in beautiful surroundings and be happy doing it. 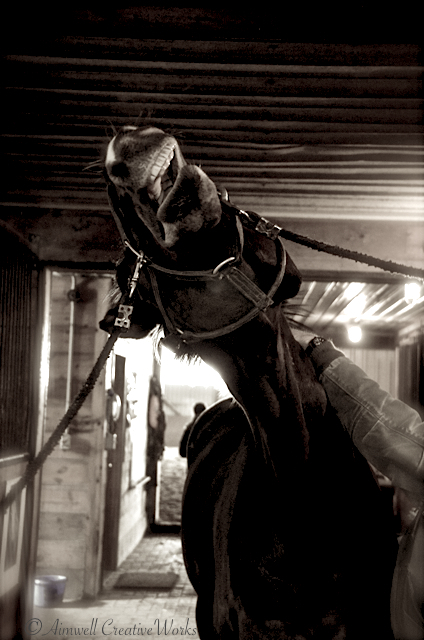 One of the things about learning to ride at a commercial equestrian facility is the variety of horses at hand. 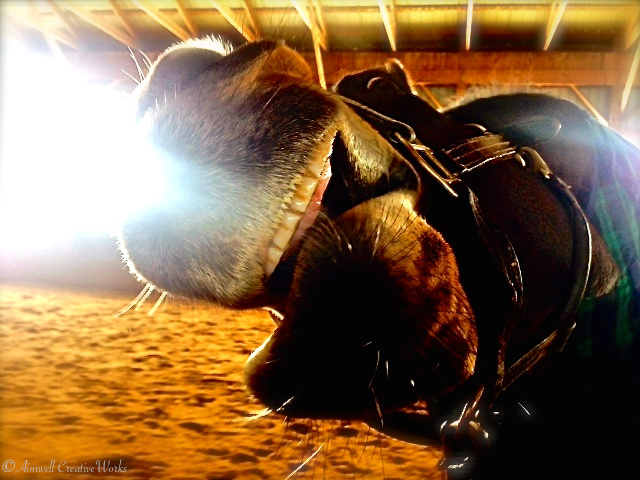 Each horse is different and has therefore, something different to teach you. 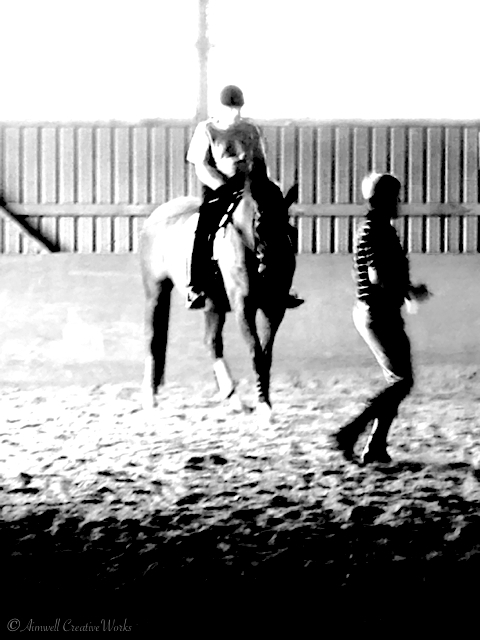 The challenges from rider to rider, horse to horse within one group lesson are all different. 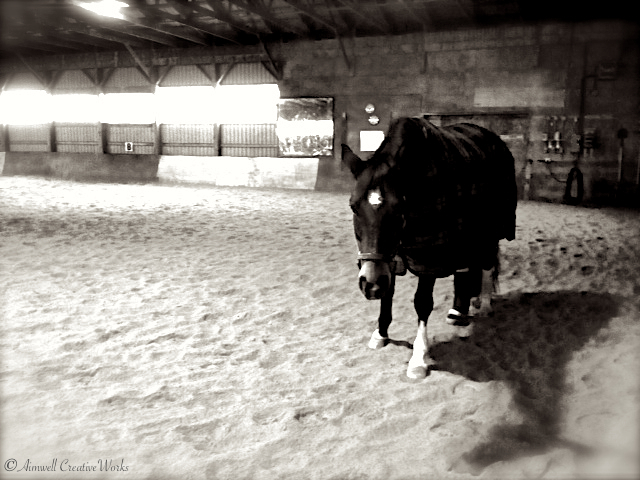 A simple exercise for one horse/rider combination may be a total disaster for another. It’s all part of the learning, fun and, occasionally, frustration. 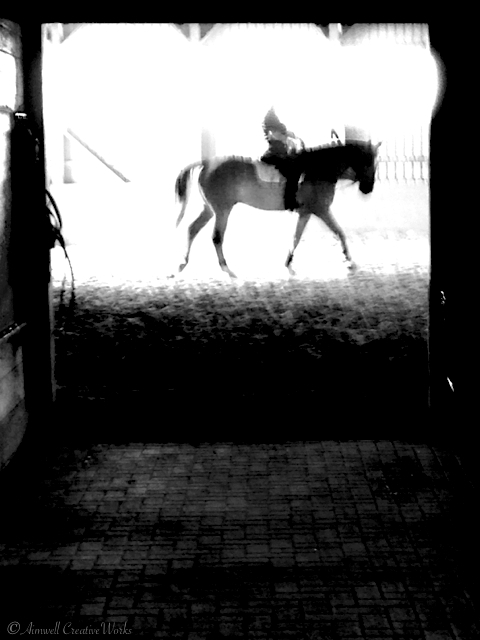 As it turned out, many of the horses at this riding school were re-trained off-the-track-thoroughbreds. They were purchased at a steal and given a second career, allowing more advanced recreational riders a skillful challenge and a cheap thrill. Most of these horses were fairly young. Many were ornery. Some were a joy to ride while others were downright unpredictable and posed a greater challenge. I didn’t mind a challenge, but I didn’t want to get killed. Peppered among the thoroughbreds were a few quarter horses, appendix quarter horses (half quarter horse/half thoroughbred) and a few non-descript ponies. 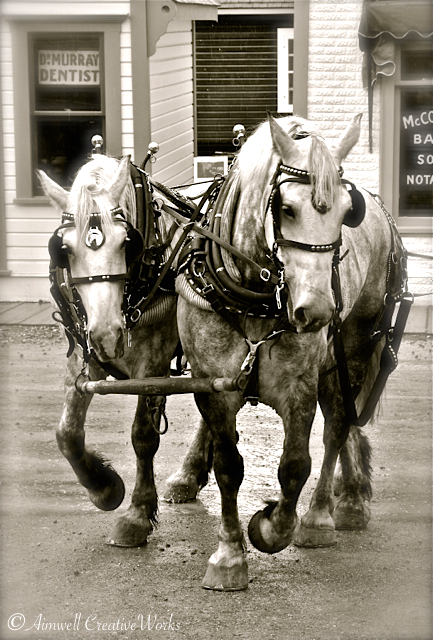 Many were older, on loan from owners who needed their horses to have a job to maintain their upkeep. I was in a group of four adults of similar riding experience (intermediate/advanced, whatever that means) and we all gathered on Saturday at 9 a.m. for a jolly good time. 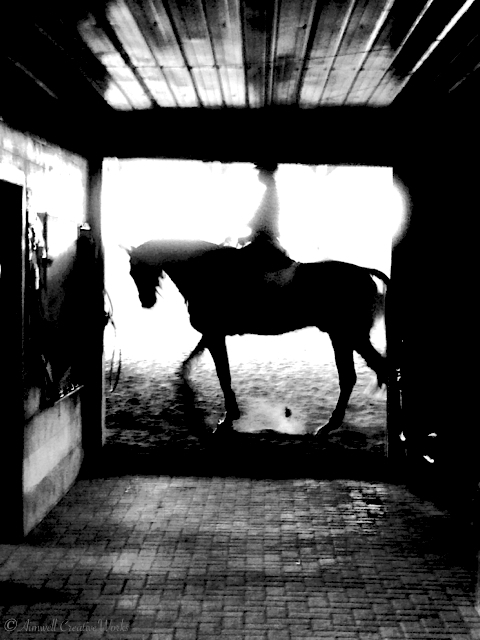 Every week was a jumping lesson ~ indoors in the winter and outdoors, my favourite, in the summer. Out in the hunter fields with all the fixed obstacles, the horses had to jump big and bold and we once-a-week recreational riders had to muster courage. The adrenaline rush was something else. Looking back I wonder what I was thinking. Our coach was a temperamental fellow of Eastern European extraction, a throwback to the cavalry. He growled a lot; lost his cool all too easily, and threw keys at the back legs of a horse if its rider wasn’t making him go fast enough. I didn’t like him. And I hated the keys. But his lessons were entertaining enough so, along with the others, I hung in. (For the purposes of this post we’ll call him The Grumpy One). I got to ride many fine horses; horses that suited my skill level. 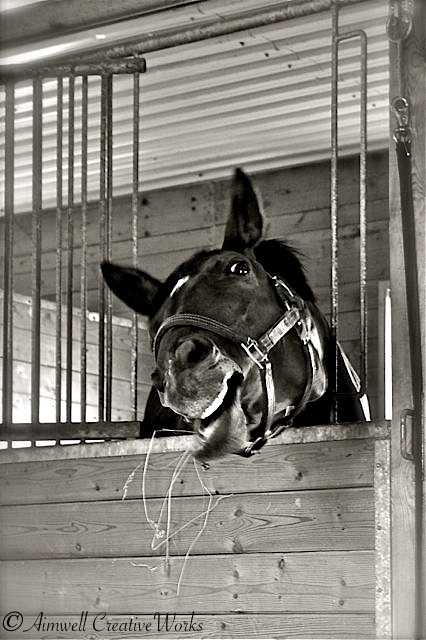 Horses like Soubrette, Raven and Finesse whose joie de vivre helped me to feel whatever existed of my own. Horses that allowed me to think and feel like I knew what I was doing. 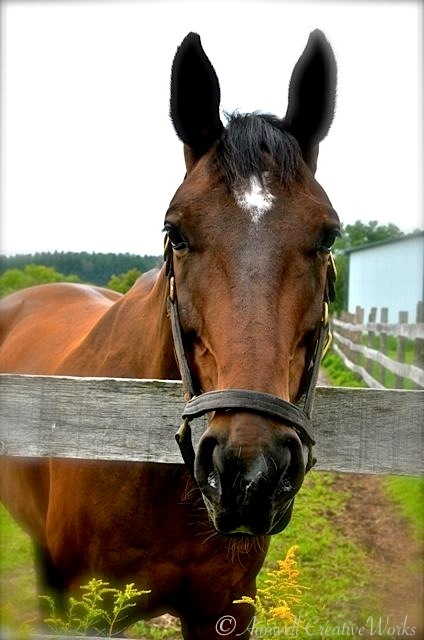 Buck was a four-year-old bay thoroughbred gelding. I don’t know if he’d ever made it to the track. He was lopsided ~ knees at slightly different heights, feet of different sizes … other things. He was also a bucker. He was the horse that would show me how broken I was. Me with Buck, my nemesis. He may look like Bear, but my Bear he wasn’t. When he was new to the riding school, he was ridden by far more advanced riders than I to get him ready for his new job. And then one day, after he’d been in the school for just a few weeks he was, to my disbelief, assigned to me. I was fairly confident of my riding abilities. After all I’d ridden most of my life and been aboard many horses who’d enjoyed kicking up their heels, however inappropriately. I’d been dislodged by a few of them too, but always got back on ready to give it another go. But from the moment I met Buck I felt a distinct unease. It was a brisk February morning. As horses and their riders trotted around the indoor arena The Grumpy One, from his position in the centre of the ring, barked instruction. 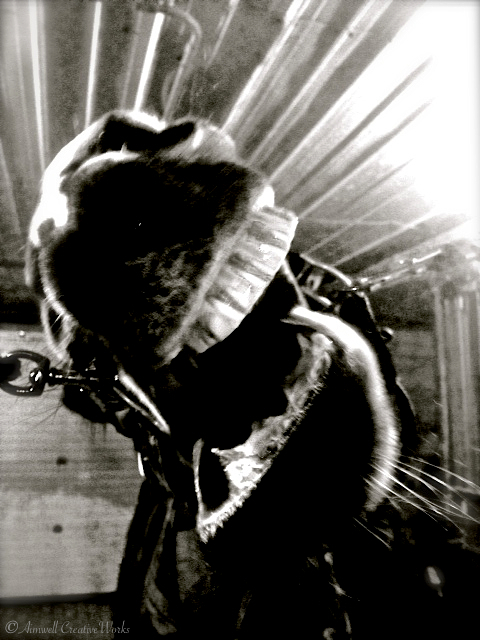 Vapours of warm breath drifted from blowing nostrils (horse and human) and sparkled off the sunlight in the frigid air. 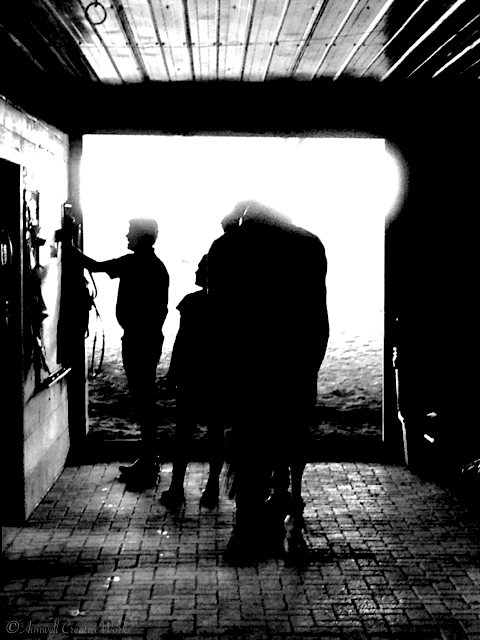 Hooves brushed through sandy footing, saddle leather creaked against cold and horses chomped absently at the bit. Half an hour in and all was well. With an unexpected heart-stopping leap my happy place became a house of horror. From nowhere and for no fathomable reason Buck was all fours off the ground and kicking his legs out behind him. He landed on terra firma with a bouncy thud and planted his feet. He snorted. Somehow I was still on board, the drum of my heart sounding an alert while a rapid pulse of terror coursed through my body. The Grumpy One looked over. He growled. Taking a deep breath, I pressed Buck forward into trot. We were on our way once more, moving in the maelstrom of the group dynamic. The Grumpy One growled more instruction. On high alert now, my attention was divided between what he wanted and what Buck was willing to give which, it appeared, was up for debate. Because it wasn’t long before he bucked again … and again … and again as if he was some manic rodeo bronc. Certainly, I was not happy nor was I comfortable with this situation. What was I doing wrong? Why was this horse being such a bully? What needed to happen to make it stop? I looked to The Grumpy One for some guidance. The scowl chiseled into his late middle-aged face told me I was out of luck. I would have to figure this out on my own. But I didn’t know what the h-e-double-hockey-sticks I was doing! Years of once-a-week recreational riding had not prepared me for anything like this. I didn’t want to end up broken in a pile of frozen horse manure. With no support or guidance, and a total lack of interest from The Grumpy One with respect to my plight, I felt my nerve, and my courage, drying up; the colour in my face draining. Frustration mounted as Buck, sensing my discomfiture (which horses always do), took full advantage and refused to move. This was supposed to be my happy time; my time away from the complete shambles that was my home life. I didn’t need this horse to give me a hard time. I didn’t want, or need, this challenge, especially without appropriate instruction. I wasn’t there to be tortured. After a final desperate appeal for help, and another growly disinterested response, I did something I’d never done before ~ I gave up. Choking back tears of frustration and deep humiliation I walked Buck to the middle of the arena and dismounted. The Grumpy One grunted. 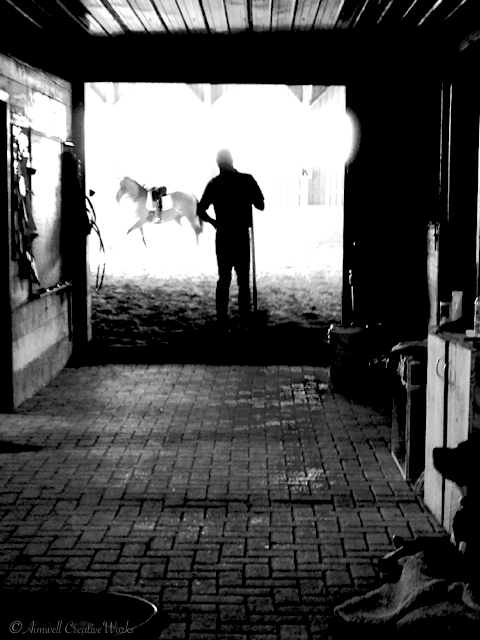 I lead Buck back to his stall. Untacked him. Left the barn. Buck had tested my mettle and I’d failed. What was supposed to make me feel better had left me feeling worse. All I wanted, needed, was a little guidance. All The Grumpy One had to do was show a little interest in helping me to work it out. All he wanted to do was growl and throw keys. It reflected a pattern of repeated negative interactions with the males in my life (human and horse, apparently) that had become all too familiar. Later, at home, I relived the experience in my head over and over, wondering what I could have done differently. Without appropriate instruction there was nothing to be done. Buck had hit a nerve and, in the interest of safety, my reaction had been to cut and run. I realized that The Grumpy One was not a good instructor for me. Perhaps worse was the notion that Buck would be assigned to me again. The apprehension around that thought was more than I was prepared to handle. 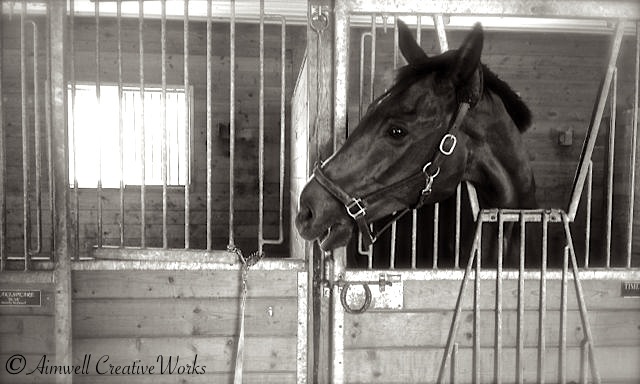 So, with no apparent other alternative, I put my passion for horses on permanent hold. I was done. It was a childish pursuit anyway, I reasoned. Time I grew up. Was I too easily discouraged? Possibly, but as a person with serious trust issues at that time, I didn’t know where to turn or who I could talk to. Obviously The Grumpy One had no interest in being the nurturing teacher I needed. As well, no one in my family understood my passion for horses, so there was no point in bothering them with my dilemma. Could I have moved to another barn? Absolutely. But my heart was no longer in it. My nerves were too frayed. Thereafter followed four of the most miserable years of my life, during which I experienced three failed attempts at in vitro fertilization; the continued downward spiral of my marriage and the moment that changed everything … the death of my grandmother.